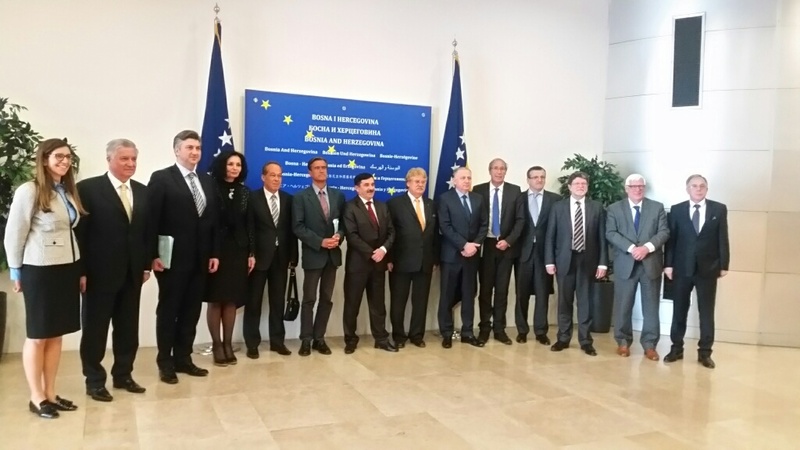 A delegation of the European Parliament’s Foreign Affairs Committee visited Bosnia and Herzegovina in order to discuss the further development of relations between Bosnia and Herzegovina (BiH) and the EU as well as the enlargement process and the situation in the region. The eight-Member delegation was led by Elmar Brok, Chair of the Committee (EPP, DE) and composed of Andrej Plenković, the Vice-Chair of the Committee (EPP, HR), Cristian Dan Preda, the Committee’s Standing Rapporteur on BiH (EPP, RO), Dubravka Šuica (EPP, HR), Tonino Picula, the Co-Chair of the EU-BiH Stabilisation and Association Parliamentary Committee (S&D, HR), Juan Fernando Lopez Aguilar (S&D, ES), Norbert Neuser (S&D, DE) and Bas Belder (ECR, NL). The Delegation was accompanied by EU Ambassador/EU Special Representative Lars-Gunnar Wigemark. The head of the EP delegation, Mr Brok stated: “Common solutions are the answers to the problems generated by the past. Individual or national interests should not overshadow the common interests.“ He also stressed that „although certain pre-conditions are being fulfilled on the European path of Bosnia and Herzegovina, for instance the issue of the census, a lot remains to be done in order for the country to obtain candidate country status in 2017.“ He welcomed the concerted efforts on the Reform Agenda by both the entities and the State and encouraged proper implementation of the reform measures. In this context he also mentioned that the reform process should be strengthened in order to attract investments, which is instrumental in the fight against the very high unemployment levels in the country. On the first day, Members paid a visit to Mostar where they strongly encouraged the local party leaders to come to an agreement on the city statute in order for the citizens of Mostar to be able to elect their representatives at the forthcoming local elections. In Sarajevo they met with Bakir Izetbegović, Member of the BiH Presidency, Prime Minister Denis Zvizdić, the Chairman of the BiH Council of Ministers, Fadil Novalić, Prime Minister of the Federation of BiH and Željka Cvijanović, Prime Minister of the Republika Srpska, members of the BiH Council of Ministers, Members of Parliament as well as representatives of civil society and the international community. During their meetings with BiH interlocutors, Members discussed the political and socio- economic situation in the country, the EU accession process following BiH’s application for EU membership as well as other issues, such as education, reconciliation, Islamic radicalisation and regional cooperation. In view of the upcoming discussion in the Council on the country’s EU membership application, Members stressed the need for further implementation of the Reform Agenda, the adaptation of the Stabilisation and Association Agreement and for introducing a sustainable EU coordination mechanism. They welcomed positive developments with regard to the housing and population census. MEPs urged their parliamentary counterparts to agree to the pending Rules of Procedure of the EU-BiH Stabilisation and Association Parliamentary Committee in order to conduct meaningful political dialogue and to be able to issue joint declarations in this important common body.